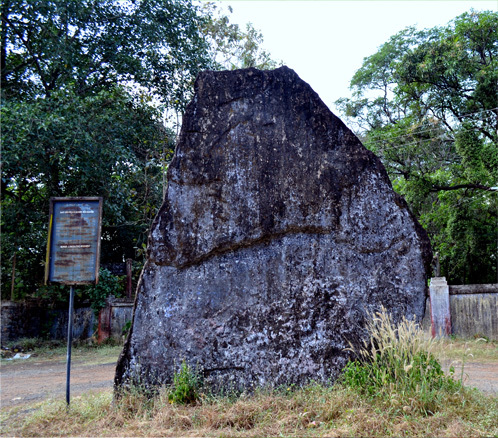 Evidences of great Stone Age civilization are abundant in Kerala which includes rock-cut caves, dolmenoids, hat stones, umbrella stones, hood stones, menhirs, urn burials etc. Gold ornaments of this age have also been found out from Puliyoor at Alappuzha. A landmark in the excavation activities was the finding out of the remains of a yatch of 11th century AD from Thaikkal, Cherthala. The recent excavations at Pattanom in Thrissur reveal Kerala’s ancient trade relationships with European countries of that time. A great library collection of ancient historic documents and books like stones and brass writings, long before printing has been introduced, are available at a school of Epigraphy at Sreepadam Palace, Thiruvananthapuram. Kerala coinage starts with Gold Parasuraman Panam. A unifaced gold spherule, resembling the coinage of ancient Tamizhakom, which the unknown Greek Mariner and author of ‘Periplus’ confronted and recorded as Kaltis. Hoards of Roman Gold and Silver coins and finds of Greeks, Chinese and Arab coins point to Kerala’s age old trade relation. A rare hoard of Roman silver from Nedumandam and an AKSUM copper coin from Karur throw welcome light on the most probable ‘Pepper Route’ functioned as a connecting link of the maritime trade route, starting from western coast to Karur, the capital of Chera empire. A counterpart of ‘Silk Route’. Kaarshapanam of Magadha Mauryan period has been transacted in Kerala as is evidenced by Kottayam, Eyyal and Ankamali hoards. 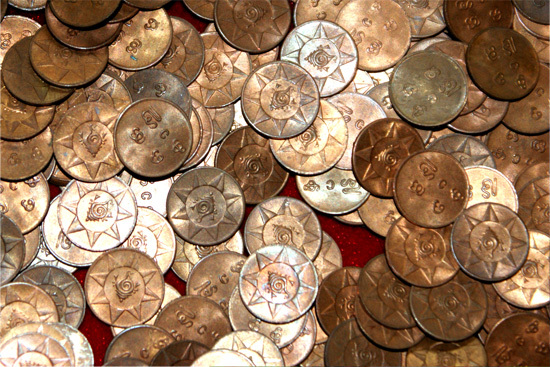 Ankamali hoard consists of 783 Punch Marked Coins only. From Parasuraman Panam to silver Vira Kerala Panam and thereafter upto the security edged Chitra Half Rupee (1946) of old Thiruvithamcore, one could see a continuity though not rarely broken by interludes such as that of Kalabhra. Shedding light in these appalling black holes of Kerala history is challenging. Vellichakram (Silver chakram) had been in circulation throughout Kerala right from the last phase of 16th century, as told by hoard obtained from the Siva Temple at Kasaragod. Kannur Silver Panam tells an unprecedented story about the Muslim matrilineal head of state. Kozhikode Gold Panam and Kochi Silver puthan represent the regional heritage uniquely. Venetian Ducat otherwise known as ‘Aamaada’, a pious gold piece for the Syrian Christians speaks about a different aspects of its cultural scenario. A vast number of coins of Travancore dating from 1600 to 1946, speaks volumes for a rich coin heritage. Silver half-one-two chakram series tell about one of the oldest legal tender coins of India. Existence of Ananthasayanam coins and certain coins in brass (bronze) expand the imagination of the researcher, though they are being misinterpreted. Kerala coinage holds a brief to the most outstanding commemorative of India. Silver T99 and T 1805, otherwise called Talassery Vella/ Talassery Panam were issued by the English factories to commemorate the fall of two heroes-Tipu Sultan and Pazhassiraja. That the English company’s mint at Mumbai itself commemorated this great fall is rather strange. The State Archaeology Department has the world’s largest collection of Palmyra leaf manuscripts. Palm leaf manuscripts are manuscripts made out of dried palm leaves. Having documented since the period of AD 1450, these documents are written in the ancient scripts called Vattezhuthu, Kolezhuthu, Malayanma, Grandham, Tamil etc.